From left to right : Jan, Dolly, Lillian, Mr. Too, Mayor Linda Jackson, Dee, Counsellor Sandra Yeung Rocco , Jack, Jennifer and Chris. International feng shui expert and best-selling author Lillian Too visited World of Feng Shui boutique at Vaughan Mills on February 24. She was in town for an exclusive Canadian visit to promote her latest book, Get Rich With Water, and to lead a day-long feng shui extravaganza, sponsored by World of Feng Shui boutique. Vaughan Mayor Linda Jackson and Councillor Sandra Yeung Racco attended the book signing along with scores of customers. 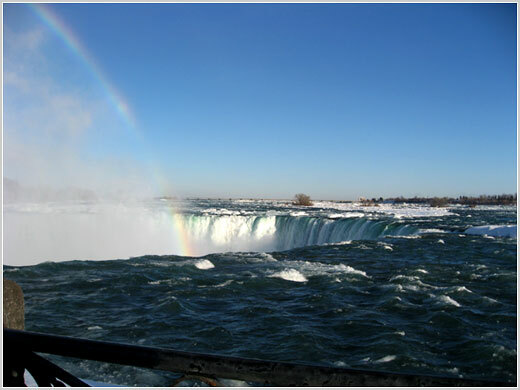 Niagara Falls with rainbow which is a very auspicious sign. World of Feng Shui boutique, owned by Dee Johl and Dolly Sidhu, offers feng shui consulting services and unique merchandise for homes and offices. It is Canada’s only World of Feng Shui boutique and celebrates its first anniversary in May. The business serves people of many ethnocultural backgrounds from across the country, with an appealing website (www.wofs.ca) allowing customers to order products and seek advice.